Democracy is the name given to a number of forms of government and procedures which have legitimacy because they have the consent of the people they govern. The two main criteria for a democracy are, firstly that the officials exercising power have legitimate authority because they have been elected, as opposed to inheriting that authority or holding it by force; and secondly, the mechanism for changing the government is through peaceful and regular elections, as opposed to revolts, coups, or civil war. Democracy is not a theory about what the aims or content of government or law should be, only that those aims should be guided by the opinion of the majority, as opposed to a single ruler (as with an absolute monarchy, dictatorship, or oligarchy). Just because a government has been democratically elected does not mean it will be a good, just, or competent government. Thus, some polities have used the democratic process to secure liberty while others have used it to promote equality, nationalism, or other values. Democracy is also a peaceful way for a group of any size to settle arguments or make decisions. Everyone has a vote and is committed to respecting the decision that wins. This does not mean the decision will be the best one, or even a good one. It is simply a mechanism for enabling everyone to be involved in the decision making process, which gives the decisions binding legitimacy. Most of the procedures used by modern democracies are very old. Almost all cultures have at some time had their new leaders approved, or at least accepted, by the people; and have changed the laws only after consultation with the assembly of the people or their leaders. Such institutions existed since before written records, as well as being referred to in ancient texts, and modern democracies are often derived or inspired by them. Democracy in the modern world evolved in Britain and France and then spread to other nations. The main reason for the development of democracy was a dissatisfaction with the corruption, incompetence, abuse of power, and lack of accountability of the existing polity, which was often an absolute monarchy whose legitimacy was based on the doctrine of the divine right of kings. Instead of defending their country, kings were often engaging in ruinously expensive wars against other countries. Instead of using their power to enforce the rule of law and justice, they were often using this power to oppress their subjects and stifle opposition. People thought that if they could have a say in how they were governed, these abuses could come to an end. There is a tension in democracy between the rule of law limiting government and protecting individual liberties, and the rule of the people being able to override individual liberties. In modern history this has led to two competing versions of democracy. One emphasizes the purpose of the whole, but when it became atheistic has tended to slip into totalitarianism and the suppression of individual liberty. The other emphasizes individual liberty, but with the decline of its Christian underpinnings has tended to slide into social disintegration. There are many different types of democracy, from the minimalist direct democracy of Switzerland to the totalitarian democracy of communist states such as North Korea, as well as mixed systems such as the blending of monarchy, oligarchy, and democracy in the United Kingdom. As democracy is now regarded by many as the highest, or even only, form of legitimate authority, many states claim to be democratic even if they do not appear to be. One of the most damaging accusations in today's international arena is that a group or process is "undemocratic." In the Islamic world, there are democracies such as Turkey, Egypt, Iran, and Pakistan, although there are also Muslims who believe democracy is un-Islamic. Though the term democracy is typically used in the context of a political state, the principles are also applicable to other groups and organizations. In the past, philosophers from Plato and Aristotle to Thomas Aquinas and Hobbes have considered democracy to be among the worst forms of government because it could easily be corrupted and result in injustice. The chief danger is that a majority can impose its will upon a minority in a way that violates their liberties. Thus during the twentieth century, besides liberal democracies, there were also dictators such as Hitler who came to power through the democratic process and totalitarian democracies like the Soviet Union, where the populace gave strong support to the regime at various times. To function properly, democracies require a high level of education and maturity among the people who vote. If not, the process can be captured by demagogues if too many vote in a self-centered way, as happened in Weimar Germany. It can also be very claustrophobic or oppressive as majorities can use their position to intimidate minority opinions. Modern democracy has benefited from the mass education of citizens, the free press, and most especially the Protestant Reformation, which encouraged self-restraint and public-mindedness and trained people in self-government. The word "democracy" derives from the ancient Greek demokratia (δημοκρατία). It combines the elements demos (which means "people") and kratos ("force, power"). Kratos is an unexpectedly brutish word. In the words "monarchy" and "oligarchy," the second element, "arche," means rule, leading, or being first. The Athenian democracy developed in the Greek city-state of Athens (comprising the central city-state of Athens and the surrounding territory of Attica). Athens was one of the very first known democracies and probably the most important in ancient times. Every adult male citizen was by right a member of the Assembly and had a duty to participate and vote on legislation and executive bills. The officials of the democracy were elected by lot, except generals (strategoi) and financial officials, who were elected by the Assembly. Election was seen as less democratic and open to corruption because it would favor the rich (who could buy votes) and the eloquent, whereas a lottery gave everyone an equal chance to participate and experience, in Aristotle's words, "ruling and being ruled in turn" (Politics 1317b28–30). Participation was not open to all the inhabitants of Attica, but the in-group of participants was constituted with no reference to economic class and they participated on a scale that was truly phenomenal. Never before had so many people spent so much of their time in governing themselves. However, they only had the time to do this because of the huge number of slaves that underpinned the Athenian economy. Political rights and citizenship were not granted to women, slaves, or metics (aliens). Of the 250-300,000 inhabitants, about one third were from citizen families and about 30,000 were citizens. Of those 30,000 perhaps 5,000 might regularly attend one or more meetings of the popular Assembly. Athenian polity was an expression of its philosophy. One of the distinguishing features of ancient Greece was its lack of a priestly class who would mediate between the people and the gods and also be channels of the divine laws and will. Instead, the philosopher Aristotle summed the humanistic Greek view up in his definition of human beings as "political or social animals," or as another philosopher put it, "man is the measure of all things." Men could only live perfect and self-sufficient lives if they became active citizens, knowing how to rule and be ruled by participating fully in the life of the state. Thus, for Athenians, making laws and arguing about policy was their duty and right. This contrasts with a religiously based culture where it is the gods who make or hand down the laws and human beings do not have the authority to make or change these laws. So individual citizens of Athens had the right to take the initiative: to stand to speak in the assembly, to initiate a public law suit (that is, one held to affect the political community as a whole), to propose a law before the lawmakers, or to approach the council with suggestions. There were many critics of Athenian democracy and twice it suffered coups. For example in 406 B.C.E., the Athenians won a naval victory over the Spartans. After the battle, a storm arose and the eight generals in command failed to collect survivors: The Athenians sentenced all of them to death. Technically, it was illegal, as the generals were tried and sentenced together, rather than one by one as Athenian law required. Socrates happened to be the citizen presiding over the assembly that day. He refused to cooperate, objecting to the idea that the people should be able to ignore the laws and do whatever they wanted just because they were in the majority. This tension in democracy between the rule of law, limiting government and protecting individual liberties, and the rule of the people, being able to override individual liberties, resurfaced in modern history with two competing versions of democracy. Most parts of Europe were ruled by clergy or feudal lords during the Middle Ages. However, the growth of centers of commerce and city-states led to great experimentation in non-feudal forms of government. Many cities elected mayors or burghers. There were various systems involving elections or assemblies, although often only involving a minority of the population. Such city states, particularly on the Italian peninsula, often allowed greater freedom for science and the arts, and the Renaissance blossomed in this environment, helping to create conditions for the re-emergence of democracy. One of the most significant influences on the development of democracy was Protestantism. The hierarchical Roman Catholic Church supported absolute monarchy and was a powerful opponent of democracy and liberalism. The fragmentation and restructuring of Christianity that accompanied the Reformation enabled groups of Christians in some countries to experiment and set up their own congregations based on different ecclesiologies, such as Presbyterianism and Congregationalism. These arguments and discussions over church polity spilled over into politics and influenced the development of democracy. Instances of democracy that have been cited include Gopala in Bengal, the Polish-Lithuanian Commonwealth, the Althing in Iceland, certain medieval Italian city-states (such as Venice), the tuatha system in early medieval Ireland, the Veche in Slavic countries, Scandinavian Things, and the autonomous merchant city of Sakai in sixteenth century Japan. However, few of these have an unbroken history into the modern period—an exception being the Althing, which lays claim to being the oldest parliament in the world. Furthermore participation in many of these post-feudal governments was often restricted to the aristocracy. The origin of the modern liberal democracy that has expanded so rapidly in the past century lies in the evolution of English political institutions. The government of the English in the tenth century, before the Norman conquest and the imposition of feudalism, was derived from the customs of the Germanic tribes who invaded and settled in England during the fifth century. The English were a nation of freeholders living in homesteads. A group of these homesteads formed a village which had an assembly, the village-moot presided over by the village-reeve. A hundred or so of such villages constituted a Hundred, which also had a meeting presided over by an elder where they managed their own affairs. A number of hundreds formed a shire, presided over by an earldorman appointed by the King and Witan. The kingdom made up of these shires was ruled by the Witenagemot and the King. The Witenagemot was the "Meeting of the Wise Men," who could elect and depose the King, decide questions of war and peace, make and amend the laws, confirm the appointment of bishops and earldormen and settle disputes. The King was greatly respected but could not alter the law, levy a tax, or make a grant of land without the consent of the Witenagemot. The English system of government worked from the bottom upwards, from the freeman to the King, every person holding his own land as his right, choosing his own earldorman who in turn helped to choose the King. The law was customary law, which formed the basis of Common Law, a body of general rules prescribing social conduct. It was characterized by trial by jury and by the doctrine of the supremacy of law. The law was not made, but discovered as revealed in the traditional life and practices of the community. It was thought of as God's law which had been handed down through custom from generation to generation. Thus no one had the authority to unilaterally go against the wisdom of the past generations and make new law. In 1066, William the Conqueror invaded England and imposed the feudal system, which worked from the top down. The King owned all the land and gave it to his knights, earls, and barons. In this way he gathered up, and concentrated in himself, the whole power of the state. Subsequent English history has been a long struggle to reassert the Anglo-saxon principles of government against this imposed feudalism. Representation of the People Act (1918), which gave the vote to all men and women over the age of 30. Universal suffrage and political equality of men and women (1928). However, with the expansion of the franchise came the expansion of government, as politicians made promises to the electorate so as to win votes and be elected. These policies could only be delivered through greatly increased public expenditure financed through increases in taxation. This has led to a gradual but significant loss of freedom as governments have used their democratic mandate to engage in social engineering, retrospective legislation, and the confiscation of property in a manner reminiscent of the Greek abuses that Socrates railed against. It is now commonly thought that the will of a democratically elected government should not be constrained, because this would be undemocratic, whereas the whole raison d'etre of democracy was to preserve and not to justify the destruction of liberty. A significant further development of democracy occurred with the establishment of the United States. The political principles of liberal democracy that were worked out over the centuries in England and articulated by the philosophers Locke, Hume, and Montesquieu were inherited by the United States and embodied in its Constitution. Having a constitution that described functions and limited the political institutions was a novel innovation. The founding fathers who framed the Constitution wanted to establish institutions that could preserve liberty and prevent the excessive growth of government, which was seen as the chief threat to liberty. So the United States Constitution set down the framework for government with checks and balances based on the separation of powers, so that no institution or person would have absolute power. 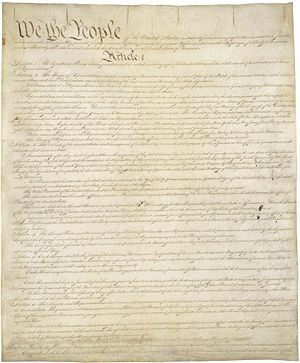 To further limit the reach of government and protect people's liberties, the founding fathers produced a Bill of Rights, a series of amendments to the Constitution. It was adopted in 1788, and provided for an elected government through representatives, and it protected the civil rights and liberties of all except slaves. This exception came to haunt the new republic. Although not described as a "democracy" by its founding fathers, today it is the model many people aspire too. The system gradually evolved, from Jeffersonian Democracy to Jacksonian Democracy and beyond. Following the American Civil War, in 1868, newly freed slaves, in the case of men, were granted the right to vote under the passage of the 14th Amendment to the United States Constitution. Women's suffrage was finally achieved in the 1920s with the passage of the 19th Amendment. The U.S. Constitution states that the power comes from the people: "We the people…." However, unlike a pure democracy, in a constitutional republic, citizens in the U.S. are only governed by the majority of the people within the limits prescribed by the rule of law. Constitutional republics are a deliberate attempt to diminish the threat of mobocracy, thereby protecting minority groups from the tyranny of the majority by placing checks on the power of the majority of the population. Thomas Jefferson stated that majority rights cannot exist if individual rights do not. The power of the majority of the people is checked by limiting that power to electing representatives, who then govern within limits of overarching constitutional law, rather than the popular vote or government having power to deny any inalienable right. Moreover, the power of elected representatives is also checked by prohibitions against any single individual having legislative, judicial, and executive powers, so that basic constitutional law is extremely difficult to change. John Adams defined a constitutional republic as "a government of laws, and not of men." The framers carefully created the institutions within the Constitution and the United States Bill of Rights. They kept what they believed were the best elements of previous forms of government. But they were mitigated by a constitution with protections for individual liberty, a separation of powers, and a layered federal structure. Inalienable rights refers to a set of human rights that are not awarded by human power, and, thus, cannot be surrendered. The main theme running through this political evolution is that the impetus for greater democracy was the desire to establish the rule of law so as to preserve and expand freedom—the freedom of religion and speech, freedom of association, movement and trade, and secure ownership of property. Hence, the name "liberal" democracy. To guarantee this, the importance of a separation of powers, or functions, came to be recognized with a separate executive, legislative, and judiciary. It was thought that a democratically accountable legislature and independent judiciary was the best way to prevent a king or imperious chief executive from misusing his position and acting arbitrarily. The underlying values and culture that underpin Anglo-American democracy are, first, the value of the individual. Great Britain, and its offspring America, developed an exaggerated sense of the value of the individual as compared to other countries, which can be traced back to the Anglo-Saxon period. This individualism was grounded in the nuclear family structure, which valued liberty above other values such as equality and authority. This was reinforced by English religion, which was a notoriously Pelagian version of Christianity that also emphasized freedom and responsibility. Protestantism, especially its evangelical version with its emphasis on individual salvation and the love that God has for each individual soul, reinforced this respect for the individual, and his or her rights and responsibilities. Subsequent major and minor British political philosophers such as Locke, Hume, J.S. Mill, and Toland, have all supported individual liberty against the state and the majority. A second value in Anglo-American democracy is respect for tradition and custom as the source of the authority for morality and the law. Medieval English philosophy had a tendency towards nominalism, which made it hard to imagine, and thus believe, in the existence of abstract constructs such as the state. And modern British and American philosophy has been strongly empirical, valuing experience over abstract reason. As David Hume said, "the rules of morality are not conclusions of our reason." Experience reveals that the world people is very complex, full of idiosyncrasies, and that social institutions are the product of human actions but not conscious human design. Thirdly, Anglo-American individualism traditionally had a strong Christian component, such that people naturally tended to be public minded. Many voluntary societies and charities were formed and freely given public service was common. The French observer Alexis de Tocqueville in his famous work, Democracy in America (1835), is famously to have said that he found the strength of America in her churches and voluntary societies, which gave individuals the organizational strength to exercise their liberties according to their various opinions. Democracy, when it developed on the continent of Europe, took a very different turn. In the Middle Ages most European countries had modernized by adopting Justinian's legal code, which gave the authority for creating law to the ruler. Throughout the Middle Ages, continental monarchies had been very powerful, with the unchecked authority to lead their countries into ruinous and destructive wars. They had this power because large armies were necessary for defense, as there are few natural barriers on the continent and most countries had several neighbors with whom there would be disputes over territory. So loyalty and service of the whole has always tended to be more important than individual freedom. So in the modern era, the most progressive monarchs were enlightened despots. They were often followed by dictators. The idea that the state should have this authority was not challenged. In theory, France was an absolute monarchy in which the king was the source of all laws and administrative authority. In practice, the monarch was hedged in by a medieval constitution which he could not change without the risk of undermining the entire structure. The French state in the 1780s, was on the brink of bankruptcy due to an ancient, inequitable, and inadequate tax base, as well as over spending on wars with Britain. There were many other economic and social problems the monarchy was unable to solve. This led to a widespread dissatisfaction with the status quo and a desire for change. To break the deadlock, King Louis XVI called the Estates General, whose status and authority was very unclear, to meet for the first time since 1614. The forces that were unleashed soon resulted in the collapse of royal authority and social order. The Estates General turned itself into a National Assembly in 1789 and abrogated to itself the national sovereignty and gave itself the right to create a new constitution. The Assembly swept aside the past, publishing the Constitution of 1791 which revolutionized the whole social and political structure of France. Feudalism, legal privilege and theocratic absolutism were abolished and society was rationally reorganized on an individualist and secular basis. Many of these changes, such as legal equality and the abolition of feudal dues were welcomed by the general population. However, by claiming the authority to remake society, disregarding all previous laws and institutions, the door was opened for one person or group after another to impose their vision or ideals on the country in an almost permanent revolution. The Declaration on the Rights of Man and Citizen was published guaranteeing legal equality; the separation of Church and State and religious toleration came in 1791. Many of these changes were welcomed with few regretting the end of theocratic monarchy. Many of those who did fled the country. In the winter of 1791, the Assembly considered legislation against such émigrés. They debated and voted for the safety of the State against the liberty of individuals to leave. In 1792, another assembly called the Convention drew up a republican constitution, the Constitution of the Year I, and voted to execute the king. People opposed to the revolution were arrested and executed in the Terror that followed. The revolution became increasingly radical and atheistic and there was a campaign of dechristianization in 1794. An altar to the Cult of Reason replaced the Christian one in Notre Dame and many priests were martyred. In 1795, the Convention approved the new Constitution of the Year III which was later ratified in a plebiscite. The new constitution created the Directoire (Directorate) and the first bicameral legislature in French history. This should have been followed by elections, but the members of the Convention wanted to hang on to their positions because they thought they knew better than anyone else what was best for the country and so disregarded the constitution. The impasse was broken in 1799, when Napoleon Bonaparte staged the coup which installed the Consulate. This effectively led to his dictatorship and eventually (in 1804), to his proclamation as Emperor, which brought to a close the First Republic. There followed 150 years of instability—periods of republic, monarchy, and empire—culminating in the establishment of the Fifth Republic in 1958. The rationalism of the French Enlightenment provided the foundational values of the French Revolution and the type of democracies that developed from it. Idealistic thinkers assumed that a model society could be designed on rational principles and then implemented. Reason, like geometry, has a tendency to assert that there is one right answer. The Enlightenment was also deeply anti-clerical; it was led by Voltaire (1694–1778), who spent much of his time ridiculing religion and things that were old. Eventually it turned atheistic, as the French religious establishment was unable to intellectually refute the more extreme deist ideas that had been imported from England. The leading political philosopher in France was Jean Jacques Rousseau (1712–1778). His conception of the ideal polity was very illiberal. He thought that in an idealized state of nature, people were born pure but had been corrupted and enslaved by civilization and institutions such as private property. To change this, he advocated a new corrective social contract as a blueprint through which a proper society could be built. To begin this, everyone in the society would subscribe to a new social contract. In order to be free, every individual had to surrender his rights to a collective body and obey the general will. The state is vested with total power, which is legitimate because it has the consent of the majority. The general will, by definition, is always right and reflects the real interests of every member of society. So anyone who disagrees with the general will is mistaken and acting contrary to his own best interests. It is the ruler's responsibility to correct him and force him to act for his own benefit. What is supremely important is the whole, of which an individual is merely an expendable a part. Rousseau didn't agree with the idea of private property. He thought it was the source of social ills, tending to corrupt people and destroy their character. He regarded the man without property (the noble savage, for example) to be the freest. Instead, he thought that nearly all property should be owned by the state. Rousseau also recognized the importance of education and maintained that the state should control it, so as to be able to indoctrinate children into the values of the state. Although Rousseau was not a supporter of democracy—he preferred aristocracy—his ideas affected the course of the French revolution and subsequent democracy. One impetus behind French democracy was the desire to seize the power of the state and use it to remodel society on a rationalistic basis. The vision was of a country organized and united to achieve a common purpose. As long as the government was based on popular sovereignty it had the power and authority to make any laws. This innovation was very attractive to others who wished to change and modernize society, and became a basic value of democracies throughout Europe. Being rationalistic, the supporters of the French Revolution thought its principles were universal and could, even should, be adopted by others. However, such democracies tended to become totalitarian. One of the key values of French democracy which is also shared by socialism and communism is equality. Not equality before the law so much as people having equal lifestyles—having the same amount of living space and the same income. But such equality, which has been called the Procrustean equality, is incompatible with freedom. If people are free, they can make choices which have different outcomes, which leads quickly to inequality. For example, even if people earn the same amount of money they may prioritize and spend it differently—one person on food and luxuries, another on travel, another on a larger home, another on children's education, another on drink and drugs; another invests it and engages in commerce, and another saves it and passes it to his or her children. So the only way to achieve equality is to take away people's freedom to make such choices. The principles of French democracy were eagerly embraced by other idealistic revolutionaries throughout Europe. The historian François Furet in his work, The Passing of an Illusion explores in detail the similarities between the French Revolution and the Russian Revolution of 1917, more than a century later, arguing that the former was taken as a model by Russian revolutionaries. This model was attractive to Marxists, as it justified a small group who thought they knew what was best for the people; a group claiming to be the "vanguard of the proletariat," seizing power in the name of the people, and using that power to compel the people to fit into the new ideal economic and social order. People who resisted or disagreed were to be sent to re-education camps or executed. This was not uncommon in the communist democracies established by the Soviet Union, the People's Republic of China, and elsewhere. These countries are one-party states based on the principles of democratic centralism. They have a centrally planned command economy and a powerful secret police to seek out and punish dissenters. 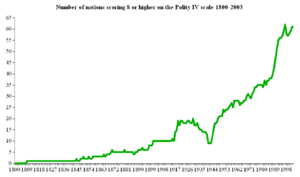 Number of nations 1800-2003 scoring 8 or higher on Polity IV scale, another widely used measure of democracy. The Economist's Democracy Index offers another measure of democracy. The palest blue countries get a score above 9, while the black countries score below 2. The rise of democracies in the twentieth century has come in successive "waves of democracy," variously resulting from wars, revolutions, decolonization, and economic circumstances. Early in the century, several countries that were part of the British Empire gradually gained their independence: Australia, New Zealand, and Canada all became stable, liberal democracies modeled on the British parliamentary system. South Africa became a democracy, but with a franchise limited to white people. After World War I the Allies, under pressure from Woodrow Wilson, decided with the Treaty of Versailles to break up the Austro-Hungarian Empire into new nation states. Some, like Austria, established a democratic system, while in others, such as Hungary, strong men came to power either to establish national unity or to defend the country from predatory larger neighbors. Without either mature national identities or democratic traditions to draw upon, they were all very unstable, mostly degenerating into nationalism. The Ottoman Empire, too, was partitioned and different countries created and administered under League of Nations mandates awarded to France, Britain, and Italy. The countries contained a mixture of ethnic, national, and religious groups without a common identity, which made government very difficult. The British, who administered Iraq, imposed a parliamentary constitution on the country along with a monarch. However, the democratic roots were not very deep and there was a coup in 1958. In Russia, the absolute monarchy of Tsarism was overthrown in the February Revolution of 1917. Although they did not have widespread support, the Bolshevik Party, led by Lenin, seized power in a coup the following October. They claimed to represent the "vanguard of the proleteriat" and the real interests of the people who, because of "false consciousness" hadn't voted "correctly" in elections for the democratically elected All Russian Constituent Assembly. The Great Depression also brought disenchantment and instability, and in several European countries, dictators and fascist parties came to power. They did so either by coups or by manipulating the democratic system claiming to be able to solve problems which liberalism and democracy could not. Dictatorships were established in Germany, Italy, Spain, Portugal, Poland, the Baltic Republics, the Balkans, Brazil, Cuba, China, and Japan, among others. Even in the United States Franklin D. Roosevelt wielded much more power than previous presidents which coincided with a huge expansion of government. The aftermath of World War II brought a definite reversal of this trend in Western Europe and Japan. With the support of the U.S. and UK, liberal democracies were established in all the liberated countries of western Europe and the American, British, and French sectors of occupied Germany were democratized too. However in most of Eastern Europe, socialist democracies were imposed by the Soviet Union where only communist and communist associated parties were allowed to participate in elections. Membership of these parties was restricted, which disenfranchised most of the population. The communist party maintained itself in power by claiming to be the "vanguard of the proletariat," using intimidation and force against "counter-revolutionaries." The Soviet sector of Germany became the German Democratic Republic and was forced into the Soviet bloc. The war was also followed by decolonization, and again most of the new independent states had democratic constitutions often based on the British parliamentary model. However, once elected, many rulers held their power for decades by intimidating and imprisoning opponents. Elections, when they were held, were often rigged so that the ruling party and president were re-elected. Following World War II, most western democratic nations had mixed economies and developed a welfare state, reflecting a general consensus among their electorates and political parties that the wealthy could be taxed to help support the poor. In the 1950s and 1960s, economic growth was high in both the western and Communist countries as industries were developed to provide goods for citizens. However, it later declined in the state-controlled, command economies, where incentives for hard work and the freedom to innovate were lost. By 1960, the vast majority of nation-states called themselves democracies, although the majority of the world's population lived in nations that experienced sham elections, and other forms of subterfuge. A subsequent wave of democratization saw new liberal democracies in several nations such as Spain and Portugal. Some of the military dictatorships in South America became democratic in the late 1970s and early 1980s as dictators were unable to pay the national debts accumulated during their rule due to theft and the misuse of loans. This was followed by nations in East Asia and South Asia by the mid-to-late 1980s, that were becoming industrial producers. In 1989, the Soviet Union, in effect, collapsed economically, ending the Cold War and discrediting government-run economies. The former Eastern bloc countries had some memory of liberal democracy and could reorganize more easily than Russia, which had been communist since 1917. The most successful of the new democracies were those geographically and culturally closest to western Europe, and they quickly became members or candidate members of the European Union. Russia, however, had its reforms impeded by a mafia and oligarchs that crippled new businesses, and the old party leaders took personal ownership of Russia's outdated industries. The liberal trend spread to some nations in Africa in the 1990s, most prominently in South Africa, where apartheid was dismantled by the efforts of Nelson Mandela and F. W. DeKlerk. More recent examples include the Indonesian Revolution of 1998, the Bulldozer Revolution in Yugoslavia, the Rose Revolution in Georgia, the Orange Revolution in Ukraine, the Cedar Revolution in Lebanon, and the Tulip Revolution in Kyrgyzstan. The Republic of India is currently the largest liberal democracy in the world. Representative democracy involves the selection of the legislature and executive by a popular election. Representatives are to make make decisions on behalf of those they represent. They retain the freedom to exercise their own judgment. Their constituents can communicate with them on important issues and choose a new representative in the next election if they are dissatisfied. Classical liberal democracy is normally a representative democracy along with the protection of minorities, the rule of law, a separation of powers, and protection of liberties (thus the name "liberal") of speech, assembly, religion, and property. Direct democracy is a political system in which the citizens vote on major policy decisions and laws. Issues are resolved by popular vote, or referenda. Many people think direct democracy is the purest form of democracy. Direct democracies function better in small communities or in areas where people have a high degree of independence and self-sufficiency. Switzerland is a direct democracy where new laws often need a referendum in order to be passed. As it is a very stable and prosperous country, few people see any urgent need for change and so few new laws are passed. The system is also very decentralized, with few policies decided on a national level. This means that the French, Italian, and Romance language speaking minorities can order their affairs the way they choose and the large Swiss-German-speaking majority cannot over rule the local level, even if it wanted to. Socialism, where the state economy is shaped by the government, has some forms that are based on democracy. Social democracy, democratic socialism, and the dictatorship of the proletariat are some examples of names applied to the ideal of a socialist democracy. Many democratic socialists and social democrats believe in a form of welfare state and workplace democracy produced by legislation by a representative democracy. Marxist-Leninists, Stalinists, Maoists, and other "orthodox Marxists" generally promote democratic centralism, but they have never formed actual societies which were not ruled by elites who had acquired government power. Libertarian socialists generally believe in direct democracy and Libertarian Marxists often believe in a consociational state that combines consensus democracy with representative democracy. Such consensus democracy has existed in local-level community groups in rural communist China. The only form of democracy considered acceptable to many anarchists is direct democracy, which historically discriminates against minorities. However, some anarchists oppose direct democracy. Pierre-Joseph Proudhon argued that the only acceptable form of direct democracy is one in which it is recognized that majority decisions are not binding on the minority, even when unanimous. However, anarcho-communist Murray Bookchin criticized individualist anarchists for opposing democracy, and says "majority rule" is consistent with anarchism. Sortition (or allotment) has formed the basis of systems randomly selecting officers from the population. A much noted classical example would be the ancient Athenian democracy. Drawing by lot from a pool of qualified people elected by the citizens would be a democratic variation on sortition. Such a process would reduce the ability of wealthy contributors or election rigging to guarantee an outcome, and the problems associated with incumbent advantages would be eliminated. Certain ethnic tribes organized themselves using different forms of participatory democracy or consensus democracy. However, these are generally face-to-face communities, and it is difficult to develop consensus in a large impersonal modern bureaucratic state. Consensus democracy and deliberative democracy seek consensus among the people. Plato criticized democracy for a number of reasons. He thought the people were often muddle-headed and were not suited to choose the best leaders. Worse, democracy tends to favor bad leaders who gain and maintain power by pandering to the people instead of telling them unpleasant truths or advocating necessary but uncomfortable policies. Furthermore, in a democracy, people are allowed to do what they like, which leads to diversity and later social disintegration. It leads to class conflict between the rich and poor as the latter try to tax the former and redistribute their wealth. Morally, Plato said, democracy leads to permissiveness. The end result, he argued, would be the rise of a tyrant to reimpose order. When one examines the way that many democracies in the modern world have turned out, one has to recognize some merit in his arguments. Aristotle contrasted rule by the many (democracy/polity), with rule by the few (oligarchy/aristocracy), and with rule by a single person (tyranny/monarchy or today autocracy). He thought that there was a good and a bad variant of each system (he considered democracy to be the degenerate counterpart to polity). He thought monarchy best for a very large state and democracy only feasible for a small community where people knew each other. Aquinas too taught that "the kingdom or monarch is the best form of government as long as it is not corrupt." The next best form of government was aristocracy, understood as the government by the best, and finally democracy, the government by the people. However, the best form of all, according to Aquinas, is a blend of the three, taking into consideration the needs and the circumstances of each society. A blend gives one the best of monarchy—a single person as a focal point for the loyalty of the whole people, who can act as a final arbiter in disputes and who links the past, present, and future. But a monarch can do little alone. An aristocracy made up of the finest people in the land, who come from a lineage and tradition of public service, would take many of the responsible positions of governance. Not having to stand for election would mean they wouldn't have to pander to the electorate and instead could make the better decisions. A democratic element means that the wishes and opinions of the ordinary people cannot be overlooked in the direction of government and the formation and implementation of policy. Separation of powers, a term coined by French political Enlightenment thinker Baron de Montesquieu (1685-1755), is a model for the governance of democratic states, which he expounded in De l'Esprit des Lois (The Spirit of the Laws), a work published anonymously in 1748. Under this model, the state is divided into branches, and each branch of the state has separate and independent powers and areas of responsibility. The branches are normally divided into the Executive, the Legislative, and the Judicial. He based this model on the British constitutional system, in which he perceived a separation of powers among the monarch, Parliament, and the courts of law. Subsequent writers have noted that this was misleading, since Great Britain had a very closely connected legislature and executive, with further links to the judiciary (though combined with judicial independence). No democratic system exists with an absolute separation of powers or an absolute lack of separation of powers. Nonetheless, some systems are clearly founded on the principle of separation of powers, while others are clearly based on a mingling of powers. Montesquieu was highly regarded in the British colonies in America as a champion of British liberty (though not of American independence). Political scientist Donald Lutz found that Montesquieu was the most frequently quoted authority on government and politics in colonial pre-revolutionary British America. Following the American secession, Montesquieu's work remained a powerful influence on many of the American Founders, most notably James Madison of Virginia, the "Father of the Constitution." Montesquieu's philosophy that "government should be set up so that no man need be afraid of another" reminded Madison and others that a free and stable foundation for their new national government required a clearly defined and balanced separation of powers. Proponents of separation of powers believe that it protects democracy and forestalls tyranny; opponents of separation of powers, such as Professor Charles M. Hardin, have pointed out that, regardless of whether it accomplishes this end, it also slows down the process of governing, promotes executive dictatorship and unaccountability, and tends to marginalize the legislature. Free, regular elections with a secret ballot. People can stand for election either as independent candidates or as members of a political party. Voters can cast their votes freely and secretly without fear of intimidation. A separation of powers or functions which is set out in a constitution so that there are checks and balances and no one person, group, or institution can attain or exercise unlimited power. The job of the legislature is to codify laws, passing new ones if necessary. Within this framework, the executive implements the policies that have been elected. The judiciary upholds the laws. An independent judiciary which interprets the law without fear or favor. A free and independent media able to report, discuss, and comment on events, public persons, and expose corruption and the abuse of power without fear. The rule of law which protects people's liberties. Freedom of association, to form political, religious, civic, and charitable groups free from government control. Freedom of religion, and an ecumenical civic consensus that values all legitimate forms of religion as promoting values supportive of the public welfare. Freedom of speech—the right to hold and espouse any opinion without violating the laws of libel or inciting a breach of the peace. Private property is very important, so that a person can be independent of the state. Education and literacy, which encourages people to think for themselves. 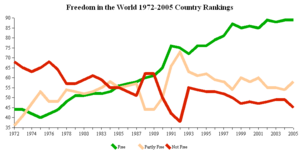 This article has discussed democracy as it relates to systems of government. This generally involves nations and subnational levels of government, although the European Parliament, whose members are democratically directly elected on the basis of universal suffrage, may be seen as an example of a supranational democratic institution. On the other hand there are many who criticize the democratic deficit within the European Union. There is no European demos and parties in the Parliament are all national ones. The only body with the right to propose legislation is the European Commission whose members are appointed by governments and not elected. Aside from the public sphere, similar democratic principles and mechanisms of voting and representation have been used to govern other kinds of communities and organizations. Many non-governmental organizations decide policy and leadership by voting. In business, corporations elect their boards by votes weighed by the number of shares held by each owner. Trade unions sometimes choose their leadership through democratic elections. In the U.S., democratic elections in unions were rare before Congress required them in the 1950s. Cooperatives are enterprises owned and democratically controlled by their customers or workers. The number of liberal democracies currently stands at an all-time high and has been growing without interruption for several decades. As such, it has been speculated that this trend may continue in the future, to the point where liberal democratic nation-states become the universal standard form of human society. This prediction formed the core of Francis Fukuyama's "End of History" theory. However the resurgence of Islam with a vision of a restored caliphate, the rise of China as an economic superpower while remaining a one-party state, and the contraction of nascent democracy in Russia have dented that prediction. Not everyone regards democracy as the only form of legitimate government. In some societies monarchy, aristocracy, one-party rule, or theocracy are still regarded as having greater legitimacy. Each of them is capable of producing good government. Whether they change into democracies depends on a country's political culture and traditions, which themselves are a product of its family structure, religion, geography, demography, and historical experience. As these change and evolve so too will a country's polity. In the twenty-first century a number of problems with democracy have emerged. The eclipse of limited government. The aim of constitutional democracy was to limit government. The separation of powers was developed to prevent the arbitrary exercise of power, along with the rule of law, due process, and the distinction between public and private law. However, with the appearance of a universal franchise, it has seemed unnecessary to limit government. It is commonly asserted that if a government is elected by the majority of the people, it should have the right to pass any measure and enact any policy. Limiting the power of a legitimately elected government has come to appear undemocratic, thwarting of the will of the people, which is one of the problems originally identified by Socrates. The rising influence of special interest groups. Modern elected governments often do not serve the agreed opinion of the majority, but instead serve numerous special interest groups who lobby for special treatment from the government. Such a relatively small group greatly benefits from legislation passed in its favor, whereas the impact on the rest of the population is so small that it may not seem worthwhile to oppose it (or, the general population may simply be unaware of detrimental provisions in bills offered by special interest groups). Thus there is an increasing prevalence of bargaining democracy as opposed to representative democracy. Coalitions are formed of a multitude of special interests, each of which consents to the special benefits granted to other groups only at the price of their own special interests being equally considered. Group selfishness is thus a greater threat to democracy than individual selfishness. In many respects, Western democracy has come to be manipulated by lobbyists, or group interests, while the wishes of the majority are ignored. Worse, policies the majority would actively disapprove of, which further the interests only of elite minorities, are the ones enacted. Government above the law. Although constitutionalists sought to limit government by the separation of powers, they did not separate the functions sufficiently. Thus, legislatures pass not only laws but are concerned with the business of government. They often pass legislation only suited to achieve the purposes of the moment. In a sense, they change the rules of the game so as to never lose. Thus there is no longer government under the law, since the government makes the law, often excluding itself and its representatives from that law. Placing the power of legislation proper and of governmental measures in the same hands has effectively brought a return to unlimited government. In this sense, the danger is that government exists for the maintenance of the ruling elite, regardless of party and country. Moreover, as with the U.S. Supreme Court, there is the problem of the judiciary evolving into a de facto legislative organ beyond which there is no appeal, by overturning laws approved by the legislative and executive branches. Excessive partisanship and the politics of envy. In the past, when the political culture was still essentially Christian-based, politicians tended to behave in a relatively responsible way. With the decline of the Christian political culture and the rise of the politics of envy, the system is open to great abuse. Politicians promise to deal with social and economic problems, unaware that government cannot solve them and indeed is often the cause. They are tempted to bribe the electorate, pandering to their baser instincts, and sometimes to misplaced idealism, in order to be elected to solve such problems. The disconnect between campaign promises and actual policies enacted once elected is often wide. It can rightly be asked if democracy is the true end goal of human civilization, or if people must settle for Winston Churchill's characterization that, "democracy is the worst form of government except for all those others that have been tried." The dilemma is essentially a spiritual or cultural one that expresses itself in the problems identified above. So often proposed solutions have been confused and superficial and even tended to make matters worse. This is because of the lack of depth of modern political philosophy compared to that of the giants of the past. It is necessary for the original political culture that gave rise to liberal democracy to be revived, updated, and articulated in a language that addresses people in the twenty-first century in a way that Locke, Montesquieu, and Mill did for their own centuries. This should explain that the purpose and value of freedom under the law is to enable people to pursue beauty, truth, and goodness and, thus, live meaningful and moral lives. It should inspire people to live according to their conscience, living unselfishly to benefit others so that the purpose for the whole can be achieved in a natural and voluntary way. When people live in this way, disagreements can be peacefully solved through the democratic process because people know each other to be good hearted. In this way, people will be able to live in peace with each other. Also, the rules for the organization of government should be updated to better protect freedom. Many lessons should have been learned from the past two hundred years of democracy. Many problems have arisen that political philosophers of the past cannot be expected to have forseen. There needs to be a clearer delineation of functions of the different organs of government so as to establish and protect the institutions necessary for freedom and peace. ↑ Sanford Levinson, Constitutional Faith (Princeton: Princeton University Press, 1989), 60. ↑ Thomas Jefferson to James Madison, 1789, in The Papers of Thomas Jefferson, eds. Lipscomb and Bergh (Washington, DC: Thomas Jefferson Memorial Association, 1903-04), 7:455. ↑ Thomas Jefferson to James Monroe, 1797, in The Papers of Thomas Jefferson, eds. Lipscomb and Bergh (Washington, DC: Thomas Jefferson Memorial Association, 1903-04), 9:422. ↑ Sanford Levinson, Constitutional Faith (Princeton University Press, 1989), 60. ↑ U.S. National Archives and Records Administration, Declaration of U.S. Independence. Retrieved November 27, 2018. ↑ Alan Macfarlane, The Origins of English Individualism (Oxford: Blackwell, 1978, ISBN 0631193103). ↑ Emmanuel Todd, Explanation of Ideology: Family Structures and Social Systems (Oxford: Blackwell, 1985, ISBN 0631137246). ↑ Rudyard Kipling, Puck of Pook's Hill (London: Wordsworth, 1984, ISBN 1853261386). ↑ J.M. Roberts, A History of Europe (London: Penguin, 1997, ISBN 0140265619). ↑ Edward W. Younkins, Rousseau's General Will and Well Ordered Society. Retrieved November 27, 2018. ↑ J.L. Talmon, The Origins of Totalitarian Democracy (London: Penguin, 1986, ISBN 0140552057). ↑ Francois Furet, The Passing of an Illusion: The Idea of Communism in the Twentieth Century (Chicago: University of Chicago, 1999, ISBN 978-0226273402). ↑ Gretchen Casper and Claudiu Tufis, "Correlation Versus Interchangeability: the Limited Robustness of Empirical Finding on Democracy Using Highly Correlated Data Sets," Political Analysis 11 (2003): 196-203. ↑ Michael Elliott, "India Awakens," Time, June 18, 2006. ↑ Pierre-Joseph Proudhon, General Idea of the Revolution. Retrieved November 27, 2018. ↑ Murray Bookchin, Anarchism, Marxism and the Future of the Left: Interviews and Essays, 1993-1998 (San Francisco: AK Press, 1999), 155. ↑ The Six Nations: Oldest Living Participatory Democracy on Earth Retrieved November 27, 2018. ↑ Amy Gutmann and Dennis Thompson, Why Deliberative Democracy? (Princeton: Princeton University Press, 2004). ↑ Plato, The Republic, Translated with an Introduction by Desmond Lee, (London: Penguin, 1974, ISBN 014044914). ↑ "The Relative Influence of European Writers on Late Eighteenth-Century American Political Thought," American Political Science Review 78(1) (March, 1984), 189-197. ↑ Seymour Martin Lipset, Union Democracy (New York: Free Press, 1977). ↑ F.A. Hayek, Law, Legislation and Liberty: A New Statement of the Liberal Principles of Justice and Political Economy (London: RKP, 1982). Bookchin, Murray. Social Anarchism or Lifestyle Anarchism: An Unbridgeable Chasm San Francisco: AK Press, 1995. Cartledge, Paul. BBC-History-The Democratic Experiment. Retrieved November 27, 2018. Casper, Gretchen, and Claudiu Tufis. "Correlation Versus Interchangeability: the Limited Robustness of Empirical Finding on Democracy Using Highly Correlated Data Sets." Political Analysis 11 (2003): 196-203. Castiglione, Dario. "Republicanism and its Legacy." European Journal of Political Theory 4, no. 4 (2005): 453-65. Copp, David, Jean Hampton, and John E. Roemer, eds. The Idea of Democracy. New York: Cambridge University Press, 1993. Elliott, Michael. "India Awakens." Time, June 18, 2006. Gabardi, Wayne. "Contemporary Models of Democracy." Polity 33, no. 4 (2001): 547+. Gutmann, Amy and Dennis Thompson. Why Deliberative Democracy?. Princeton: Princeton University Press, 2004. The Internet Encyclopedia of Philosophy. Aristotle (384-322 B.C.E.) Retrieved November 27, 2018. Jefferson, Thomas. Letter to James Madison, 1789. In The Papers of Thomas Jefferson, edited by Lipscomb and Bergh, 7:455. Washington, DC: Thomas Jefferson Memorial Association, 1903-04. Jefferson, Thomas. Letter to James Monroe, 1797. In The Papers of Thomas Jefferson, edited by Lipscomb and Bergh, 9:422. Washington, DC: Thomas Jefferson Memorial Association, 1903-04. Kaplan, Robert. "Was Democracy just a Moment?" Retrieved November 27, 2018. Levinson, Sanford. Constitutional Faith. Princeton: Princeton University Press, 1989. Lipset, Seymour Martin. "Some Social Requisites of Democracy: Economic Development and Political Legitimacy." American Political Science Review 53, no. 1 (1959): 69-105. Madison, James. "The Same Subject Continued: The Union as a Safeguard Against Domestic Faction and Insurrection." Daily Advertiser, November 22, 1787. Merriam-Webster. Definition of democracy. Retrieved November 27, 2018. The National Archives. Citizenship—The Struggle for Democracy. Retrieved November 27, 2018. The National Archives. Citizenship—Rise of Parliament. Retrieved November 27, 2018. Newmyer, Jacqueline. "Present from the start: John Adams and America." Oxonian Review of Books 4(2) (2005). Proudhon, Pierre-Joseph. General Idea of the Revolution. Retrieved November 27, 2018. Sen, Amartya K. "Democracy as a Universal Value." Journal of Democracy 10, no. 3 (1999): 3-17. U.S. National Archives and Records Administration. Declaration of U.S. Independence, 1776. Retrieved November 27, 2018. Verba, Sidney. "Would the Dream of Political Equality Turn out to Be a Nightmare?." Perspectives on Politics 1, no. 4 (2003): 663-679. Weingast, Barry. "The Political Foundations of the Rule of Law and Democracy." American Political Science Review 91, no. 2 (1997): 245-263. Whitehead, Laurence, ed. Emerging Market Democracies: East Asia and Latin America. Baltimore: John Hopkins University Press, 2002. All links retrieved November 27, 2018.
simpol.org—Plan to limit global competition and facilitate the emergence of a sustainable, sane global civilization. This page was last modified on 27 November 2018, at 22:42.